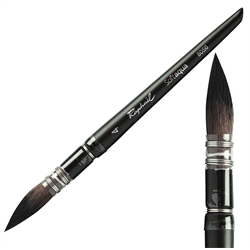 For over 200 years, Raphaël company has been committed to offering brushes that best meet the artist's needs. Recently, in collaboration with its Research and Development department, Raphaël has developed a new and exceptional synthetic fiber brush, "Softaqua", which offers a retention capacity equal to no other. The wavy undulating shape of the fiber creates spaces which hold the water molecules and therefore contain twice as much color compared to conventional synthetic fibers, which are straight and slippery.